Spanking Bethie » New Leather Toys! Look what Dan bought for me! Aren’t they lovely? I just love them! He bought them from Leather Thorn Paddles and they’re wonderfully crafted. They’re also the perfect combination of stingy and thuddy that I like. 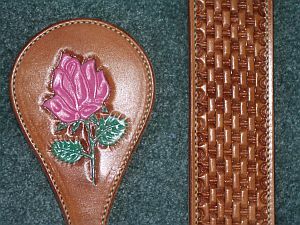 The rose paddle feels wonderful when used lightly as well as harder. The strap is pretty intense but I *like* that. Dan just couldn’t wait to try them out on me and gave me a couple of good ones with the strap and several light to heavy spanks with the rose paddle. Wow! My bottom was still nice and warm several minutes later. That’s when Dan got inspired and gave me a few more with both. That short spanking turned my bottom a very nice shade of red and it’s still hot twenty minutes later. And I’m no light-weight when it comes to spanking. I’m so jealous! I’ve been lusting after the “Brat Paddle” on the site! So you like the strap huh? YIPPIE!! John does wonderful work, and he created that strap to my specs :). I’d needed a definate ‘discipline’ implement and that strap more than fits it’s need! I’ve only felt a couple of swats from it, and I have to agree that the blend of sting and thud is amazing. Hooray! Glad you’ve found some new toys! Angel, you should get it. He does amazing work! Terri, thank you! I love the strap – it’s perrrrfect! Sandy, they’re wonderful toys, too. That’s why I had to blog about them. Some toys aren’t as good as they look. These are! Glad yu like them Bethie… 🙂 & so glad Dan liked what he saw, Pleased to be of help with the link too. 🙂 Fred loves ours too but my padle has a thistle instead of a rose on it. 🙂 thorny wench that I am. Patty, thanks for the link, we really appreciated it. John does excellent work. The paddle is very pretty! Not sure I’d want teh strap tho – heard too much about it from Terri! wow, what beautiful toys as pretty to look at as they must be “fun” to play with! I’m curious about the strap I must say, how does it compare with say a belt? just curious. . .
Am, the strap is a little heavy but that’s why I love it. It’s thuddy with just the right amount of sting I enjoy. I really wish I could meet someone who’d spank me, a nice dominating lady, but I live in a small dead town. Do you have any advice? I’m only 40 but live alone, I’m not that bad looking but am rather shy.